2019-04-09 16:12:03 Bob slipped in an instrumental version of Tom Thumb which shook things up a little. 2019-04-01 16:58:14 There were 7 categories where Bob played more than one song. Van had the highest point one in each and scored all 7. well done. 2019-04-01 03:49:05 #2 in the world......awesome, dog soldiers! Congrats to VanTheMan for the TOP result! 2019-03-29 19:39:37 Looks like we're all set to go. Good luck team! 2019-03-26 15:41:56 I took Ain't Me and Cry A While too. 2019-03-26 15:41:23 Picks are in. 2019-03-25 16:23:41 More notes.......It Ain’t Me, Babe and Cry Awhile are 10 pointers. Categories 6, 7, 9 and 13 have at least two songs from the last tour. I went with the higher points in all of them. 2019-03-25 16:08:58 Picks are in. 2019-03-25 16:01:46 Greetings, dog soldiers! I just searched through the 20 pointers and there are a few possibilities. 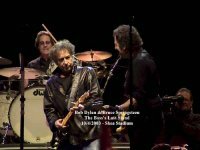 However, there is only one song that was performed by Bob on the last tour.........”It Takes a Lot to Laugh......” Does anyone see another/better choice? 2019-03-25 15:54:34 Thanks, Sellout. I'll be done soon. Will also pick It Takes a Lot. 2019-03-21 19:10:07 New leg starts in 10 days. We should be hearing something soon. 2018-12-06 20:46:37 Thank you! The tour was a great one.........Bob Dylan is never-ending!!!!!!!!!!!! See you in the spring! 2018-12-04 19:04:41 Tonight is the last night of this leg. Looks like we'll finish in the Top Ten again. Congrats to Stranger who will finish 7th on the individual side. If we all picked his set list we'd be #1. Great job!.. See you all in the late winter-early spring. Merry Christmas! 2018-11-19 23:58:14 Thank you! Bob makes me laugh doing a reggae Watchtower........I like my Watchtower Hendrix - style!!! 2018-11-19 15:52:06 Shout out to Passing Stranger - congrats on #1!